My name is Adrian Juniku. As a tuner of the Liszt Academy I was in the position to work with top pianists in the past 25 years. During this time I have prepared and tuned pianos for concerts and recordings for some of the world's finest pianists at concert halls in Budapest, Hungary. If you are a piano owner, your piano might be one of the most valuable things you own. 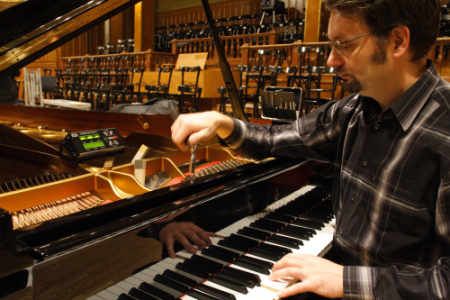 Keeping your instrument in top shape requires the skill of a professional piano technician. My speciality as a technician is concert piano tuning and voicing. Tuning is the setting of all eighty-eight notes of the piano in proper relationship to one another. In order to sound optimal, a piano must be reasonably in tune. Unfortunately, a single tuning will not satisfy, and a piano must be regularly tuned to stay in this condition. Many factors cause a piano to go out of tune, including its age, humidity, and how it is played. When a piano is new, it will be unstable for the first 1-2 years. New strings stretch out a good deal at first, but after a several tunings they become more and more stable. Changes in humidity and temperature also cause a piano to go out of tune. The last factor affecting an in-tune piano's staying power, is how it is played. The more vigorously a piano is played, the more quickly it will go out of tune. It's after about six months that it can be said the piano needs tuning. I normally recommend 2 times a year for most of my customers because a more consistently high quality of tuning can be achieved. In most cases a piano should be kept at normal pitch; that is, where A=442hz. This maintains the correct tension on the frame, and provides the optimum tone quality. A normal tuning will take about 1.5 hours; if the piano has gone significantly flat of concert pitch it may need to be gone through twice – a quick raise of the whole instrument to pitch, followed by a fine tuning. This takes about 1.5 to 2 hours(including a coffee break). Instruments used by professional players and teachers should often be tuned more often to maintain them at the very highest standard. Pianos used for concerts and recordings should be tuned before every concert or session.